Yes, Fable has been driven into the ground until only dust and ash remain, but for remaining fans of Lionhead’s fantasy series, there is small hope: the video games might be gone, but a card game is still being worked on. 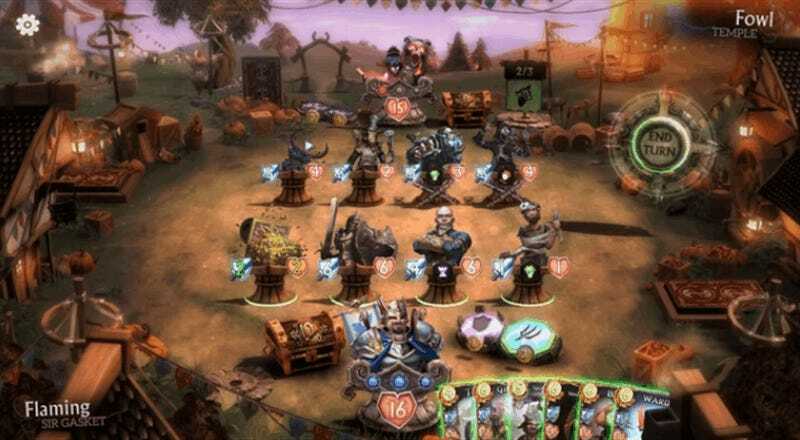 Turns out that before being shut down, Lionhead was quietly working on a digital card game called Fable Fortune. While that’s obviously been cancelled as a Lionhead project, a new team of ex-Lionhead developers have been given permission by Microsoft to keep hold of the Fable branding and try and get the game funded on Kickstarter. It’s free-to-play, is aiming for PC and Xbox One (with phone ports to follow) and has both PvP and co-op (in which players complete quests). While the footage shown looks pretty polished, don’t go counting on playing this just yet: the team are asking for a whopping £250,000 (USD$360,000 at time of posting). That’s...a lot.